For contractors, consultants, freelancers, and those who work with them. No matter how good your project management skills are, if you are balancing multiple clients, projects, and deliverables, a project tracking tool is essential. For large projects where you have many sub-tasks and a project schedule lasting multiple weeks or months, a Gantt Chart is a must-have tool. But, when working with a contractor, consultant, or freelancer, where new projects and tasks are created and completed daily or weekly, a different type of tool may be needed. Vertex42's new project tracking template was created out of a need for a tool that could help us communicate vital information, estimate expenses, and stay up-to-date on the status of each task. Though there are many online project tracking tools for freelancers and contractors, sometimes you just can't beat the flexibility that a shared spreadsheet can give you, especially now that there are so many ways to collaboratively share files and documents. This project tracker is great for contractors, consultants, freelancers and other service providers who are managing or working on multiple projects with multiple deliverables and tasks. It can help improve communication and help you stay in sync with your clients. Just remember that it is not meant to be a substitute for a well written contract - it's primary purpose is to aid in communication. We developed this project tracking template over time through our own use as we've worked with various sub-contractors over the years on a number of different projects. It is especially useful when you need to track tasks with more than just email, but don't need or want to use more complicated or formal project management software. 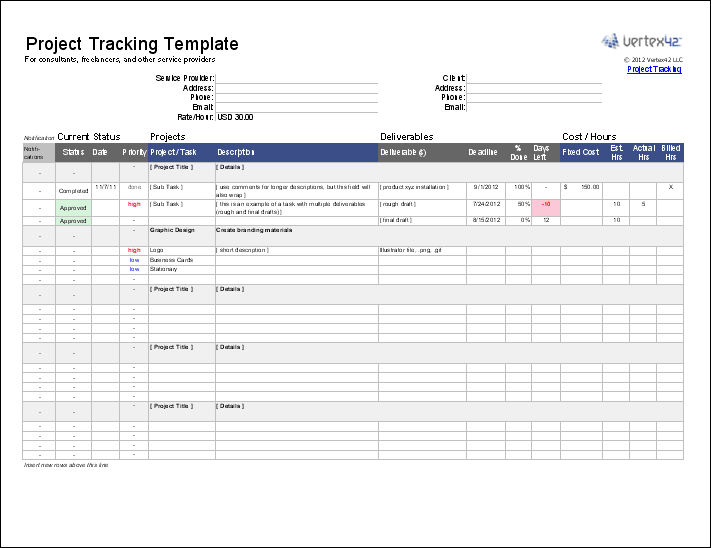 Download the new Time Tracking template to keep track of hours worked on specific projects and tasks. New Discussion-Style Comments in Google Spreadsheets Perfect for Collaboration - You can use this to post questions and comments about the project tracker as well. Collaboration: Keep the project tracker in a shared folder or Dropbox, or use the Google Docs version, so that both the client and service provider have real-time access to it. To make this truly useful, everyone needs to be able to see it regularly. Notifications: The real key to this template is the very first column. Use it to notify the client of line items that need to be reviewed. This is the column you flag to let them know they need to pay attention to something. Add cell comments in this column to include notes about the status. Email vs. the Project Tool: Don't expect the project tracking tool to eliminate the need for email. The purpose of the tool is to keep things organized, see the progress of individual tasks all in one place, and to track time and costs. It's inevitable that you'll have long email chains as you communicate about the details of the project. Use email to discuss details, and use the project tool to summarize things agreed upon. Adding Comments: Comments are the key to communication using this template. When adding a new comment, add it to the top of the existing comments, and include the date along with your name like this: "Jon Wittwer (2/16/2012): Needs a bit more re-work. See the Notes." Keep the Status Up-to-Date: Review the Project Tracker regularly and keep the status column updated. Send a quick email to notify others if you've made changes you want them to see. Set Priorities: If you are the client, make sure to set priorities and remember that not all tasks can be the most important. If you are the service provider, you may need to ask your client now and then to verify the priority of the projects. Use Concise Project and Task Names: Choose project and task names that can be easily referred to in the subject line of emails and other communication. Use Detailed Descriptions: Ambiguity is one of the biggest evils in consulting, contracting, and freelance work. Make sure the tasks are described in detail. You may need to use and refer to other documents if the details cannot be communicated effectively using the Description column or cell comments. Define Deliverables: Use the Deliverables section to summarize the deliverables and specify due dates. This may include listing the specific documents, images, files or prototypes that will be delivered as part of the project. Costs and Time Estimates: Use the Cost and Hours section to help communicate costs, either fixed bids or estimates of hours. If you work hourly, keep the Actual column updated to let your client know how you are spending their money. Don't wait to surprise them with the actual costs in an invoice. If the tasks requires intermediate reviews and feedback, update the Actual column when you ask for a review or feedback, so that the client can see how much time has been spent already, and how much time is left. The Project Tracker is Not a Contract: If you are working with sensitive information, mission-critical tasks, or high-cost projects, you may need more than just this template. This purpose of this template is to aid in communication and organization, it is not a replacement for contracts, quotes, and work orders. Gantt Chart - If you need to create a project schedule where tasks are given specific durations, this gantt chart template can be handy. 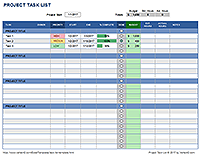 To Do List - This project tracker is really just a more detailed to do list.